Lady in reception ( Debbie ) couldn't have been nicer she got our rooms sorted for us even though the maids were extremely busy and the guy who kindly opened the bar for us whilst the rooms were getting sorted was a gent. The price was excellent, the lady on reception couldn't have been any nicer and continually apologised for the hotel's errors. Location and building were lovely. The greeting from the member of staff on duty was great and spiritedly considering the time. The bed was comfortable, and room was clean. Very comfortable bed, room and facilities are great. 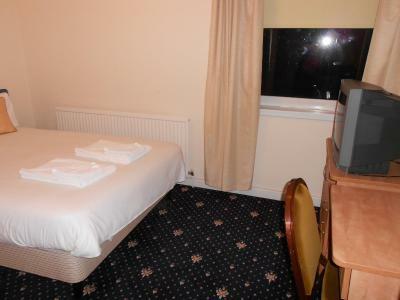 The room was although dated very clean and comfortable. The staff on reception gave us a warm welcome and pleasant chat when we were leaving in the morning to get our flight. Excellent location for walks cycling drives photos... Incredibly beautiful... And the entertainment by Alec was wonderfully played and supurbly informative. He knows his stuff. The hotel was very convinient for us and gave us rooms to suit and a good breakfast. My partner and I liked that it is a pet friendly hotel. The staff were so welcoming with our dog. Matthew at reception was more than helpful. I was disappointed the restraint wasen't open on Saturday night but the hotel had a lovely old world charm and the staff at breakfast were lovely. 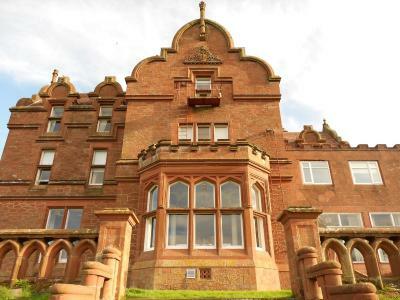 One of our top picks in Prestwick.Adamton Country House Hotel is an impressive country hotel set in 19.5 acres of private grounds, 10 minutes' drive from Prestwick Airport. It offers free Wi-Fi in public areas, a bar and a restaurant. All of the rooms at Adamton Country House Hotel have tea and coffee making facilities and a private bathroom. Rooms are either located in the historic surroundings of the main house or within the adjacent annexe wing, and some have stunning views over the grounds. The Open Golf courses of Prestwick and historic Royal Troon are less than a 10-minute drive away. There is beautiful countryside on the hotel doorstep, or the shops and restaurants of Ayr can be reached in 15 minutes’ drive. The hotel restaurant overlooks the landscaped grounds and informal meals can be enjoyed in Harry's Bar, which is a traditional period room. Adamton Country House Hotel has been welcoming Booking.com guests since 4 Dec 2009. When would you like to stay at Adamton Country House Hotel? A TV, tea and coffee making facilities, a dressing table, a mirror and a double wardrobe feature in this room. This room can accommodate 1 cot. Extra beds cannot be accommodated in this room. A hairdryer, an iron and an ironing board are available from reception. Complimentary toiletries are provided on the first night and additional are available from reception. Please note Club rooms are located in an annexe building within the grounds. 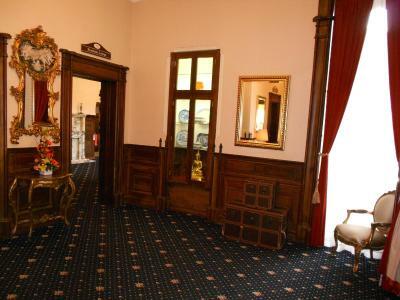 Executive rooms are set in the main house and include an en suite bathroom, a TV and tea and coffee-making facilities. House rules Adamton Country House Hotel takes special requests - add in the next step! Adamton Country House Hotel accepts these cards and reserves the right to temporarily hold an amount prior to arrival. Please note that club rooms are located in the annexe building within the grounds, while executive rooms are located in the main house. Arrived at 20:40 hours and asked to get food, unfortunately there was no service nor food they offer room service. They did pass me a Chinese takeaway menu that delivered. I felt they mislead us on the location and the decor was really poor. Very old and shabby. Rooms were very small and hot. In desperate need of a make over. The outer building and surroundings were nice. Breakfast was cold and not a lot of choice and the two people who were working in restaurant were not very helpful to be honest. And the second morning my father was asked to pay for his breakfast even though we had paid for 2 nights b and b and when questioned why he had to pay he was told take it up with reception not very helpful at all in my opinion. Shower in our room was no good taps didn't work correctly either quite disappointing if I'm being honest and the rooms themselves are dated could do with a lick of paint. The rubbish all outside bins still full from night before .wen we checked out at 11 rubbish still everywhere outside . Staff wer great .food brilliant . Bar not open, unable to check in early. 2nd day we got woken up by housekeeping entering the room telling us we shouldn't be there. I asked them to leave more than I once as we still had another night to spend in the hotel. Eventually they did leave. bed like a brick, restaurant was more buffet and food not very good, little choice on menu for the the price. staff very friendly and helped when they could. Rooms were very small. Restaurant was a set buffet menu - not much choice. Has alot of potential to be a nice hotel. Parking, A lot of cars and not quite enough spaces near hotel reception. Substantial breakfast. Good choice of items.